Your dream business website. For mobile, tablet and desktop - beautiful on every device. Marketing automation implementation and maintenance – Marketo specialists. OUR WEBSITE PROCESS IS AS SIMPLE AS 1, 2, 3, 4! Whether you are in need of a brand new website or ready to take on a redesign to your existing website, we are your trusted partner in creating the perfect design. We design, customize and program websites that are optimized for search and turn web traffic into conversions. Plainly stated, we make websites that lead to new customers. And we do it pretty well. We know the web is no longer just on the desktop. We make responsive web design a priority so that visitors have the best possible mobile experience no matter what device they are using to browse. Submit our quick form and start the conversation towards your new website. We get to know your business needs, look at performance metrics for your current website and survey the competitive landscape. We translate your vision into a website design. Don’t have a clear visions? No problem. We take our understanding of your business needs and manifest it online. Voila! Refine, enhance and prep for launch. We incorporate any final changes and get your site ready to go live. Your site has been built to look good on any device from desktop to laptop and your tablet to your phone. We make your site easy to navigate for visitors so it is primed to preform. MEET YOUR WORDPRESS WEBSITE DEVELOPMENT SPECIALISTS! 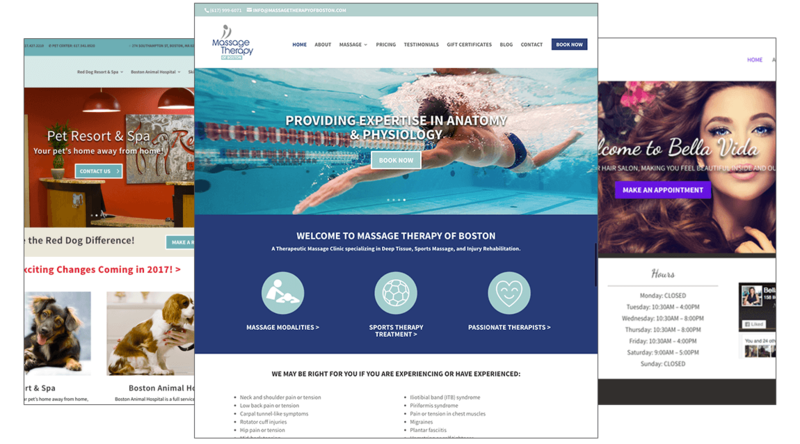 From design to launch to maintenance, we build custom websites on content management systems that grow with your business. Gone are the days of the static website. Say hello to your dynamic platform that provides a resource and converts website traffic.